A building comes – and then suddenly disappears again. What remains is a sense of inspiration, and in some cases a new image for the area in question. The architect Thomas Knüvener explains the phenomenon and tells us why it suits modern society. Mr Knüvener, the concept of ephemeral architecture is centuries old; the temporary festival buildings and theatres of the Baroque era spring to mind. Why is it seeing a revival in the 21st century? One important factor is the economic and social changes we are experiencing. Germany is a rich industrialized country, yet we no longer have the sort of continuous growth that characterized the post-war era; instead, cities undergo an unequal process of development. Phases of upturn alternate with phases of stagnation and shrinking. One key reason for many temporary constructions and architectural designs is that places in the city change. Space suddenly becomes available – on abandoned industrial sites for example – and can be used for a temporary building because there are no plans for any permanent new use. What do architects find so exciting about non-permanent buildings? What makes ephemeral architecture interesting is that it can be viewed as an experiment. Unlike with conventional architecture, which is designed for long-term use and a permanent presence, it is possible to experiment and try things out. Materials can be used that are transitory in nature. Architects can take risks – like in a lab – to develop new ideas. Is the fast pace of modern city life another reason why ephemeral architecture is coming to the fore? There is definitely a trend towards ‘eventization’. City residents find it fascinating when something is there but disappears again soon afterwards, as this turns it into an ‘event’ – just like the Baroque festival buildings did. One difference is that today’s non-permanent buildings are accessible to a broader public and not only to the nobility, as was the case in the past. This is something that civic initiatives take advantage of, as do major brands and companies. We have created an installation for the Schauspiel theatre in Cologne to mark the end of its two-year “City of Tomorrow” programme. Working together with the theatre and many other interested parties, we explored aspects such as public space and mobility. At the end of June 2017, the “Raumfähre” (literally ‘space ferry’) was launched, a temporary ferry linking the banks of the Rhine at Cologne Cathedral with the part of the city on the other side of the river. A festival centre has been set up there – another example of ephemeral architecture – with a non-permanent stage. What happens with ephemeral architecture when it is no longer needed? Generally speaking, we distinguish between three timeframes when talking about architectural usage: this can be anything from one weekend up to a month for events. At the other end of the spectrum we have permanent architecture. The third form is a period of interim use, which can last anything from several months up to two or three years. 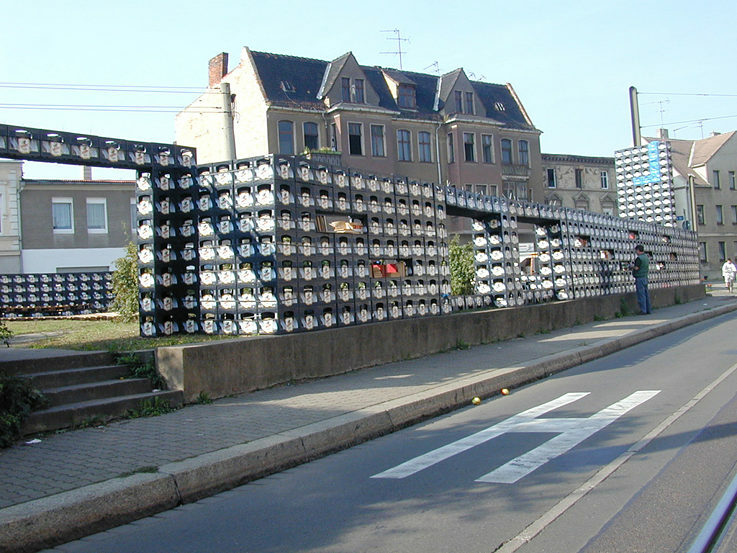 This model is typically found in Berlin, for example, and in the Ruhr region. 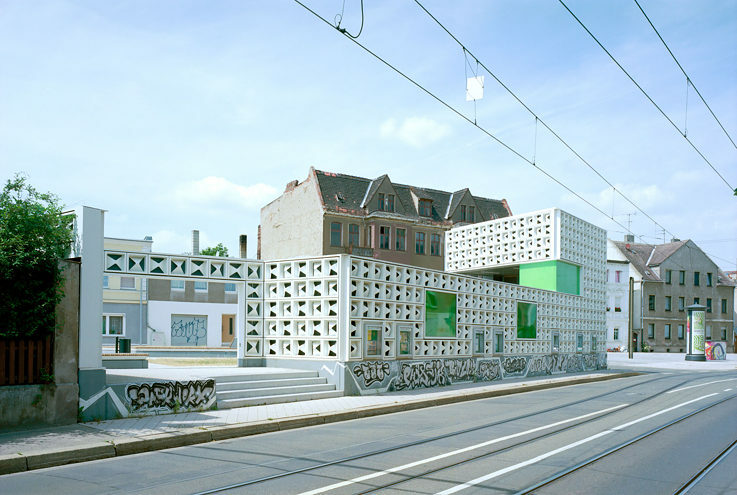 In some cases, however, temporary architecture for interim use is overtaken by developments. Like at the former Schalke-Süd goods station. Gelsenkirchen has undergone a very considerable industrial transformation. 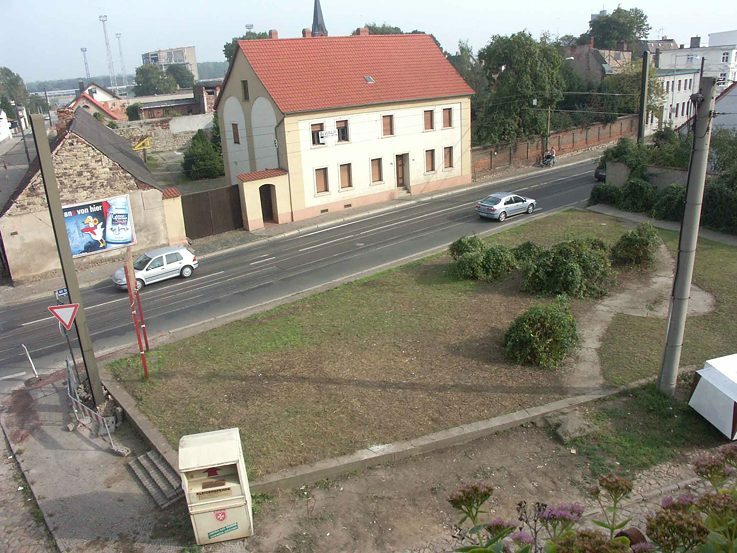 The railway station was left abandoned for a long time, but is situated very close to the city centre – actually in a well-located residential area. Because Gelsenkirchen is a shrinking city, it was unclear for ages whether the site was really needed. Urban planners came up with a strategy designed to improve the image of the local area: a temporary park was created on the site, with a covered area, a beach volleyball court and small gardens. The strategy worked, and the site has meanwhile been built on again. This is certainly an example of successful intervention: the ephemeral architecture brought about a change in image for a place previously considered rather unattractive. 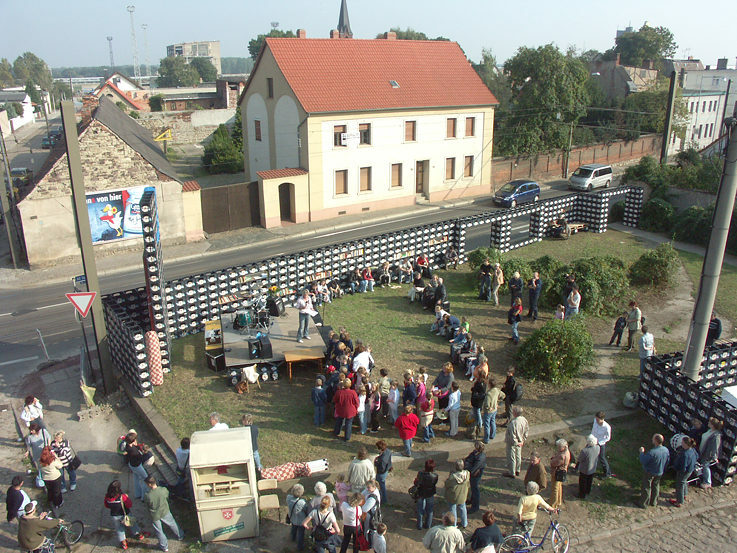 In Magdeburg, planners set up a temporary outdoor library built on a vacant site. 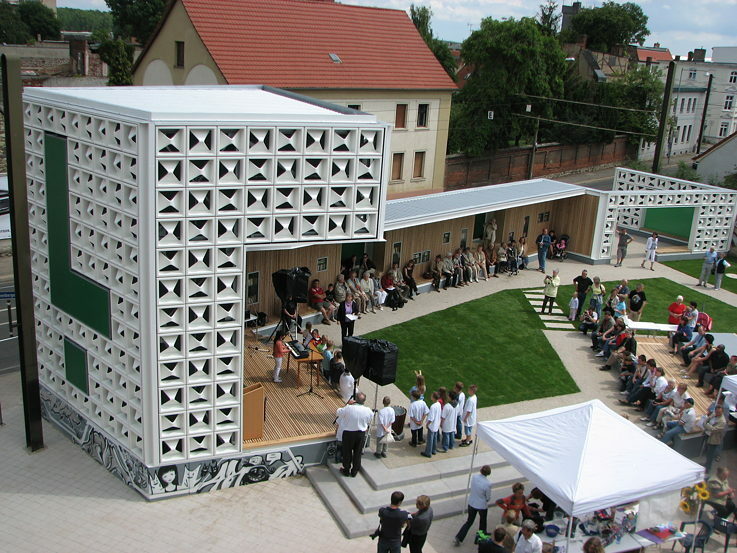 The residents helped building the library made of drinking crates. Many people used the temporary library in a central location. Due to sucess of the project, the city decided to build a permanent open air library in the same spot. Participation is a buzzword that is heard a lot in urban planning and development nowadays. How does ephemeral architecture tie in with this trend? Temporary architecture offers numerous opportunities for participation. Buildings are of more simple construction than permanent ones, and can be more easily modified. Even amateurs can learn the construction methods, and can therefore be involved in decisions about what is built. One example is the “Lesezeichen Salbke” (i.e. Salbke bookmark) designed by the architectural firm Karo: together with local residents of Salbke, a shrinking district of Magdeburg, the planners set up a temporary outdoor library built of drinks crates on the vacant site of the former library. This proved so successful that the decision was taken to build a permanent open-air library there. What are the limitations of non-permanent buildings? We have considerable expectations when it comes to comfort. The kind of heat and sound insulation that are the norm in permanent buildings cannot be achieved in temporary constructions. Ephemeral architecture is therefore no solution for long-term residential usage in our part of the world, but is an interesting addition to the architect’s toolbox. 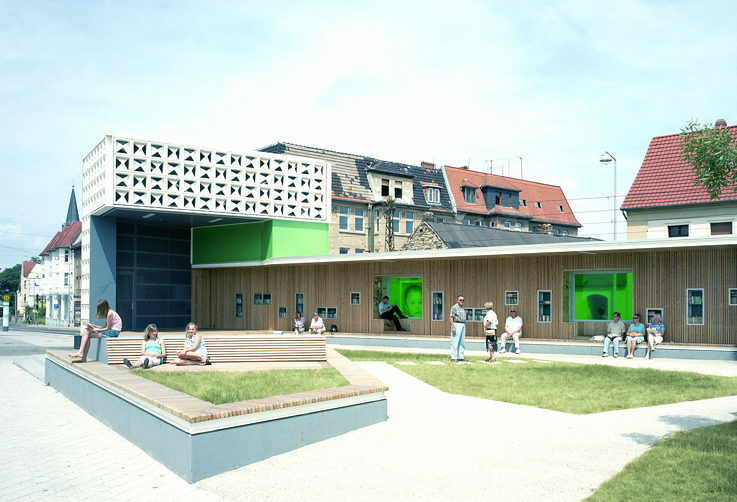 is an architect and landscape designer who runs a firm in Cologne. He also teaches at Texas A&M University. Through activities, workshops and discussions, he takes an active part in the public debate of the manmade environment. Petra Schönhöfer conducted the interview. She is a freelance cultural journalist.